PLYMOUTH MEETING, PA, and ATLANTA, January 11, 2018 – CenterSquare Investment Management (www.centersquare.com), a global investment manager focused on actively managed real estate and infrastructure strategies, announced today the implementation of the BasisCode Compliance software platform as its core compliance management system for its global investment staff and clients. CenterSquare, which has approximately $9.6 billion in assets under management, became an independent investment firm as of January 2, 2018, having been sold by Bank of New York Mellon to the firm’s management and the private equity firm of Lovell Minnick Partners. The firm was founded in 1987 as Urdang Capital Management and was acquired by BNY Mellon in 2006. Lovell Minnick Partners is a private equity firm with expertise in investing in the financial and related business services sectors based in Radnor, PA.
BasisCode ComplianceTM (www.basiscode.com) offers the industry’s most comprehensive software platform that improves compliance management for financial firms, compliance consultants, law firms and other service providers. The software simplifies and centralizes compliance management, ranging from compliance testing and risk assessment to trading surveillance, insider trading, and staff certifications. The platform provides robust reporting features and an easy-to-use portal for seamless interaction with employees and advisors. The rules-based engine makes it simple for users to modify workflow logic through the platform portal. CenterSquare has installed BasisCode Compliance’s Essentials, a core compliance management software suite that helps manage the risk lifecycle from identification to resolution. Essentials offers a basic set of management tools that simplifies management of the core elements of a compliance program and is ideally suited for organizations with simpler compliance management needs. The cloud-based system includes testing and certifications, risk assessment, gifts and entertainment, whistleblower, document portal, robust reporting and a portal for ease of use and seamless interaction with employees. In addition, CenterSquare has adopted the BasisCode Personal Trading and Insider Trading software programs which provide complete workflow analyses totally integrated into a firm’s compliance monitoring system. CenterSquare is a global investment manager focused on actively managed real estate and infrastructure strategies. Formerly part of Bank of New York Mellon, the firm became an independent investment management firm as of January 2, 2018. CenterSquare is owned by its management and by Lovell Minnick Partners. Founded in 1987, CenterSquare manages approximately $9.6 billion of real estate and infrastructure assets as of December 31, 2017. It manages investments for institutional investors and high net worth individuals throughout global markets and across public and private capital sectors. 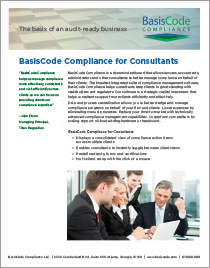 BasisCode Compliance LLC (www.basiscode.com), headquartered in Atlanta and founded in 2011, is a leading provider of regulatory compliance software solutions which help manage the risk lifecycle from identification to resolution. From core compliance to personal trading and insider trading, each BasisCode software solution is available as a stand-alone product or offered as part of an integrated package. 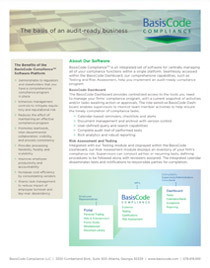 The company’s hallmark, the audit-ready capability is available in all BasisCode solutions and helps firms maintain a culture of compliance. 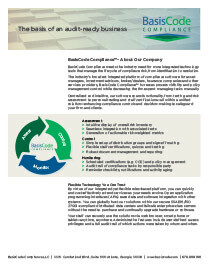 Insider Trading Manager and BasisCode Compliance are trademarks of BasisCode Compliance LLC. All other trade names are the property of their respective owners.